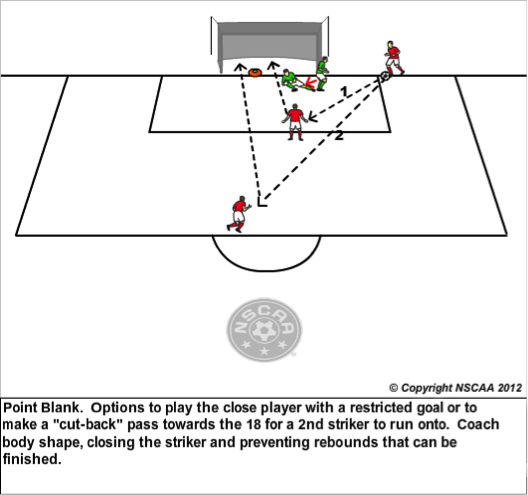 This article is for soccer goalkeepers and coaches. I want the goalkeepers to understand tactical situations so that keepers can recognize and then know the 1st, 2nd and 3rd best option for the first attacker and the attacking team. Obviously, the earlier they read the play and can anticipate the next play, the more successful they will be. I have identified two tactical flank attack situations for the goalkeeper to recognize and the position themselves and organize the defending team so that they can resolve the attack successfully. 2-goal situation. This is when the attacking team has a 1v1 situation on the flank close to the edge of the 18 yard box and most often, somewhere 18-25 yards from goal. When the defender prevents the 1st attacker from getting inside the penalty area but cannot prevent the serve, we have a bending ball behind the defense (often on the ground) situation which I call 2-goal Situation. Everyone, attackers and defenders are making vertical runs to the space in front of the goal (a lot of own goals are scored in this situation). The keeper in this situation positions themselves square to the play and inside their front post 2-3 yards depending on where the ball is. 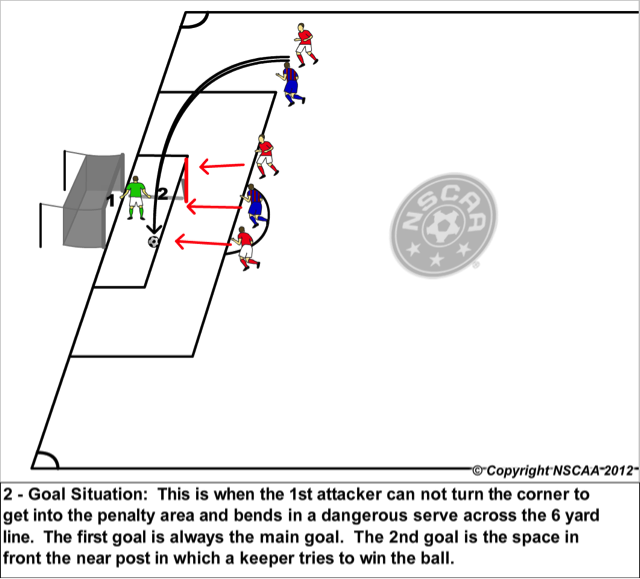 The keeper should have already organized their back post, “Joe…BACK POST” (use a name, organize when the ball is moving and cannot be played and be specific) and returned to watch the ball and pick up the intent of the 1st attacker. The 1st goal is always the main goal and goals suffered there are clearly the keeper’s responsibility. The 2nd goal is the space in front of the goal from 3-6 yards. Covering and winning balls in this space is “big time” and clearly delineates levels of goalkeepers. Of course, the keeper also has to be ready for a point blank shot from close range. 2. 3-goal situation. In this situation, the 1st attacker has beaten the outside defender and is attacking the goal line and the front post. The keeper moves to a position just outside the front post (heels even with the front post) and shoulders square to the ball and now has to cover goal #1 which is the main goal; goal #2 which is the pass across the face of the goal (2-6 yards) and goal #3 which is the delicate chip to the back post. Due to the penetration of the attacking team, there are point blank shots possibilities depending on where the ball is played from on the flank. Point Bland Shots need to be trained as many of the game winning saves come from close range. The keeper must again organize the back post by taking a quick look seeing the player in the best recovering position and using their name get them to cover the back post and prevent simple nod in head goals or touch in goals such as the one Alex Morgan scored against France in the 2012 Olympic Games (USA 4-France 2). A great finishing game, for coaches to consider, with all kind of flank service is this 8v8 (4v4) team game to train your keepers. 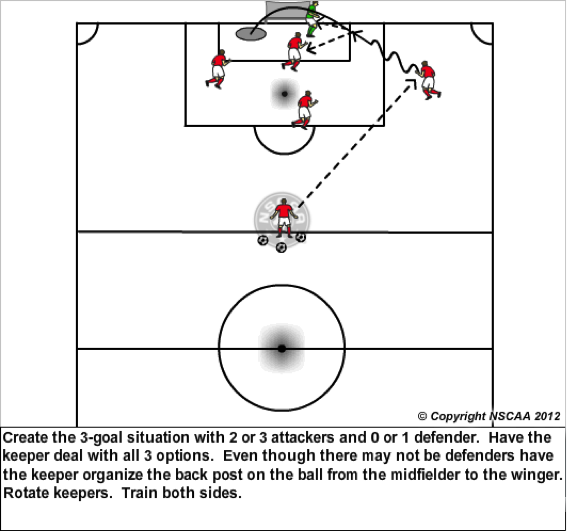 These are two flank tactical situations for goalkeepers to understand and for coaches to created training environments to help the goalkeeper recognize the situation, take up proper positioning, know how to organize the defense. 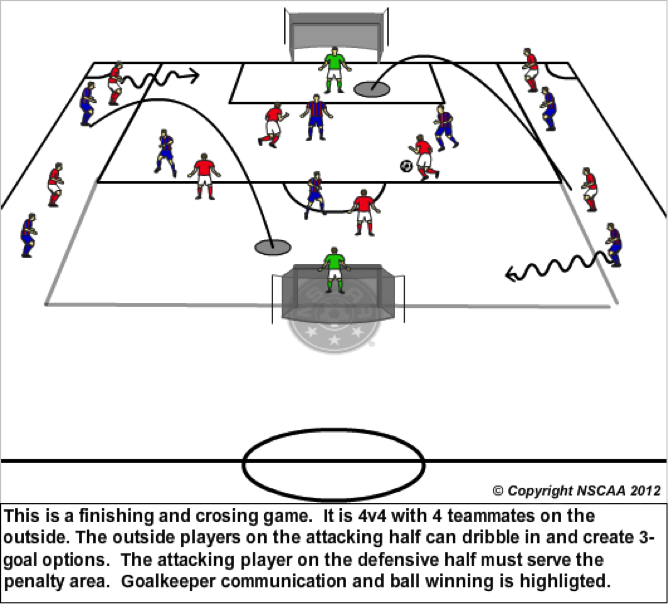 Once the goalkeeper put these tactical situations into their “reading the game” skill set, they will have a good idea of what the best options are for the attacking team so they can anticipate and make the play. Tony DiCicco, Founder and Technical Director for SoccerPlus Goalkeeper School. For information on the SPGS national camp schedule and to enroll in a course go to www.soccerplus.org or call 1-800-keeper-1. SoccerPlus was founded in 1982 by Tony DiCicco In the 30+ years since, Tony and his staff have educated and inspired tens of thousands of dedicated student-athletes using The DiCicco Method. The Soccerplus curriculum has evolved over the years to remain on the cutting edge of the modern game, but the mission of building skills, confidence and character through hard work will always be the same.